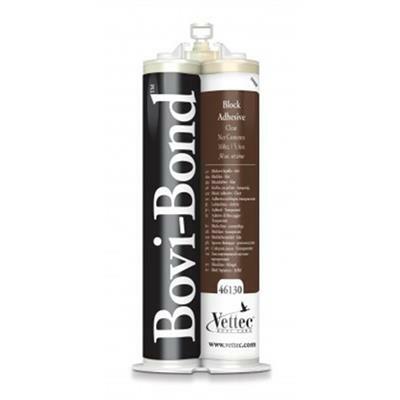 Bovi-Bond™ is a fast setting urethane adhesive used to bond wood or rubber blocks to bovine hoofs. • Weight bearing in 2 - 3 minutes. • Remove the outer cap from the cartridge. Keep the cap to apply after product is applied. • Open the cartridge by pushing the tip down on a firm surface. • Pull up on the cartridge and then backwards to remove the tip. • Insert cartridge into the dispensing gun with label side up. • Squeeze out a small amount to ensure both sides dispense evenly. • Attach a mixing tip by pressing the tip to the dispensing gun and twisting clockwise. • Apply the pour-in pad material to the hoof cavity.